From "Detective Derek" article DD0209. This article was prompted by a photo by Kent Jacobsson of a B. distachia var straussiana posted on http://fcbs.org in Jan 2009 which looked awfully like what I had from Olwen Ferris in the 1980’s as ‘Purple Haze’ only fatter! 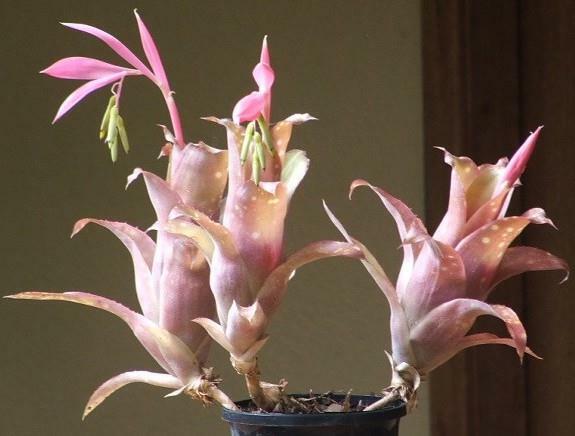 It had been bought from a ‘Flea Market’ near Newcastle NSW as just Billbergia, leaving it up to the purchaser to find out more if they were interested. 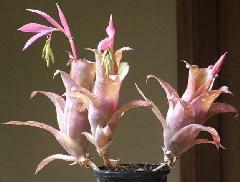 Kent’s so called Billbergia distachia var. straussiana with its blue tipped sepals and petals, from a species point of view, would key out to either B. distachia var. distachia or var. maculata depending on how you view the spots. Certainly the painting by Fossari and plants offered by Tropiflora have pronounced spotting as you see in B. saundersii so I lean more towards the type. However, this plant is of cultivar origin and as such should have a cultivar name linking in some way with ‘Purple Haze’. As such ‘Pink Piglet’ in line with Bill Morris’s reasoning behind ‘Fat Albert’ is the way to go. So check out plants you have as B. distachia var. straussiana when next it flowers, the name could well be wrong! You may be growing piglets!"